Railed handguards are an interesting thing. They come in a variety of flavors, at a variety of price points and can be used to attach all kinds of stuff to your AR-15. I'm of the "less is better" camp--in most instances, a foregrip, flashlight and slide attachment point will be what you need. I've been running a basic set of Magpul MOE Handguards with the Magpul MOE vertical grip for a while; it's a great, low cost system that I zero complaints with. On the low end of the price range, they're the clear winner. When you move up to around $100, there are a variety of rail systems available for the AR-15. In this price range, most are "drop in," which means they can be swapped in and out as easily as the stock plastic heat guards. They also come in different lengths - the typical 7-inch carbine-length, midlength and others. 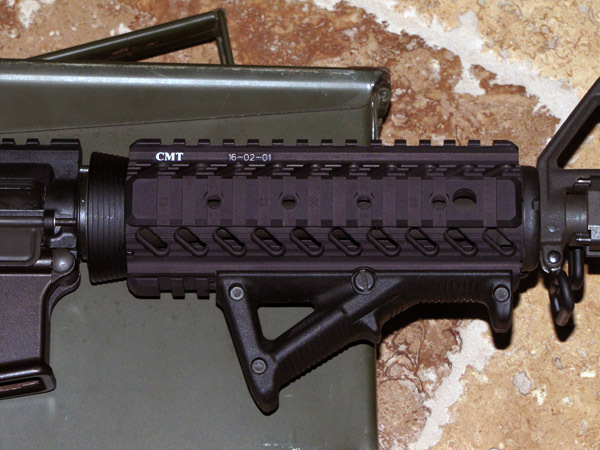 This particular set of rails, supplied by Choate for review, are drop-in carbine length rails. They are well made and install in a few minutes, without any need for tools--though if you have an AR-15 handguard removal tool, it would probably make installation even faster. Mine did not ship with any instructions, but there are plenty of instructionals out there are YouTube if you haven't swapped out handguards before. Once installed, the rails have a slight bit of side-to-side wiggle to them. They aren't going anywhere, but there is that bit of wiggle. This is my first set of drop-in rails, so I'm not sure if this is typical, but it does not effect function and is not noticeable unless you try to shift/wiggle the handguard around. Not a big deal. The rails are sized correctly--the Magpul AFG2 pictured slid on perfectly, and the rail covers snapped on fairly easily as well. These rails do the job of holding your rail-mounted accessories, as expected. In addition to the standard picatinny rails, the CMT rail also has several holes for mounting sling swivels. I haven't looked into these yet, but they could be a good alternative to buying a $30-$50 sling attachment point. These are obviously heavier than the stock plastic handguards or the Magpul MOE--they're made of aerospace aluminum, not plastic. It's to be expected and one of those tradeoffs you make when going to a railed handguard. And they are made of aerospace aluminum, so it's not like your AR-15 suddenly registers in at Garand-like weights. Overall, the Choate carbine length rails do the job they're supposed to. They price in at around $100, so they won't break the bank, either. I plan to post a follow up once I get some additional trigger time with these, so stay tuned for that. But if you're in the market, I'd check 'em out.